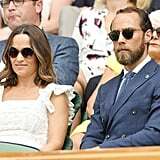 Pippa Middleton has always loved going to Wimbledon, and we've always loved looking at what she wears to the event. 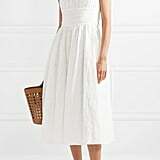 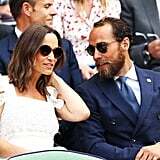 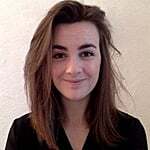 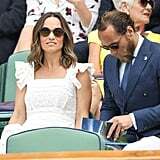 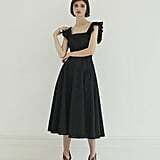 When she stepped out with her brother, James Middleton, to catch one of the matches, the stylish mum-to-be wore a gorgeous midi dress by British designer Anna Mason. 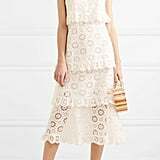 Cinched in at the waist, it perfectly highlighted Pippa's growing baby bump, and the broderie anglaise gave it a delicate yet sophisticated look. 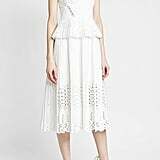 She paired the dress with blue Penelope Chilvers espadrille wedges, a straw clutch, round sunglasses, and a hat that matched her shoes. 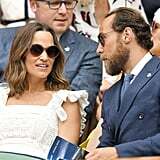 Read on to see Pippa's dress from all angles, and then shop her exact dress as well as similar options.